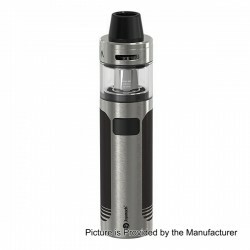 Being all-in-one style, the Joyetech CuAIO D22 starter kit skillfully integrates a 1500mAh built-in battery and a 3.5ml / 2.0ml atomizer into one solid vape pen. It has a flip to open filling system and precision top airflow control. Being child-proof, close the airflow first then you're able to open the top cap to refill the e-liquid. Having the new ProC-BF series atomizer head, it provides a more restricted draw for mouth-to- lung vapers and pretty soft flavorful vaping clouds.6 colors available.